Parents often have a lot of time figuring out how much to feed their children, whether it is a toddler who doesn't seem to be eating enough or an older child who is already overweight and is eating too much. Understanding the normal portion sizes, which depend on your child's age, can help to make sure your child is getting the right amount to eat. Remember that your goal isn't to fill up your child's plate and then make her eat everything on it until it is clean. While many older children choose oversized portions and overeat, toddlers often have the exact opposite problem. They may eat what parents think are small portions and may not even eat three meals a day. 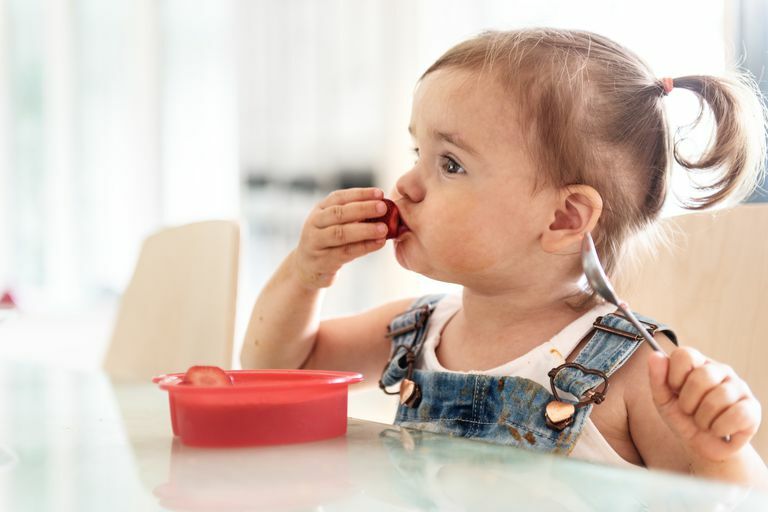 One reason that parents often think that their toddler's diet isn't good enough is that they overestimate how much they should be eating at each meal. According to the American Academy of Pediatrics, a good guideline is that a toddler portion size should equal about a quarter of an adult portion size. If your toddler wants to eat more, you can always give seconds, like another tablespoon of vegetables or the other half of a piece of fruit. The only important nutritional limits are not to overdo it on milk and juice. Any more than 16 to 24 ounces of milk and four to six ounces of fruit juice will likely fill up your child so that he isn't hungry for real food. As your child gets older, his appetite will likely grow and he will eat more. Hopefully, ​he will eat a variety of healthy foods from the five food groups and won't overdo the junk food. How much food is too much at this age though? A good guideline is that portion sizes for your preschooler or younger school-age child, kids from the age of about four to eight years old should be about a third of an adult portion size. Portion sizes for older children and teens begin to approach that for adults. Unfortunately, that sometimes means that these kids begin to eat oversized portions, just like many adults do. One of the best ways to learn about portions sizes is to learn about serving sizes. This is especially easy to do with prepackaged food, where the serving size is clearly printed on the food label. Just don't be fooled into thinking that there is only a single serving in a package that may have two, three, or even five servings. Offer a single serving of the main course of any meals that you prepare at home, and let your kids have an extra salad or other vegetables if they are still hungry. Choose child portions, small orders, or half orders when you eat out at restaurants. Buy only single serving or bite-sized snacks. Review the label and repackage foods into single serving sizes. If a bag of cookies says that a single serving is 3 cookies, then put 3 cookies in a zippered plastic bag or on a plate when you give it to your kids. Avoid letting your kids just eat from a bag of snacks or a carton of ice cream, since they will likely eat much more than one serving. American Academy of Pediatrics Policy Statement. Dietary Recommendations for Children and Adolescents: A Guide for Practitioners. PEDIATRICS Vol. 117 No. 2 February 2006, pp. 544-559. United States Department of Agriculture. Inside the Pyramid. American Academy of Pediatrics. Guide to Your Child's Nutrition.